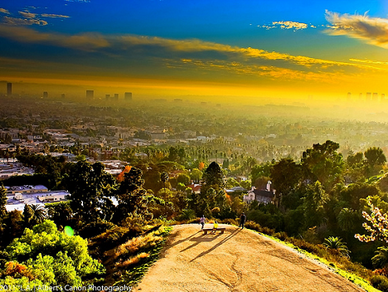 One of the great opportunities for running and hiking an iconic L.A. canyon within the heart of the city. Runyon Canyon Park is a 130-acre park located just two blocks from Hollywood Boulevard, affording great views of the Hollywood sign, the Sunset Strip and the LA Basin. There are three options for running (or walking/hiking) here. 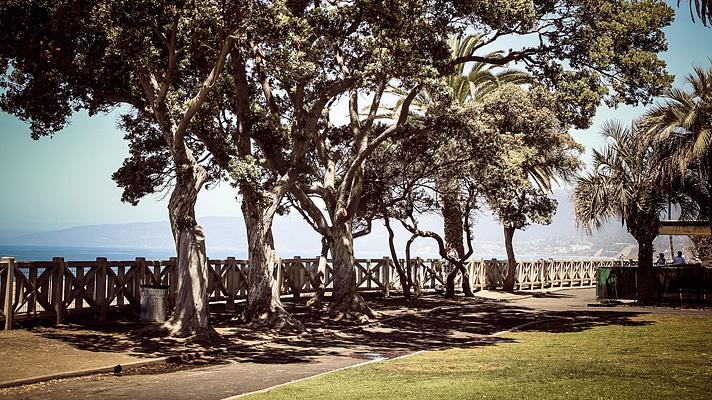 Fuller Gate — Runyon Canyon Road is the best for running because it is more ‘switchback’ in nature. The Star Trail is steeper and the Hero Trail is the most challenging. 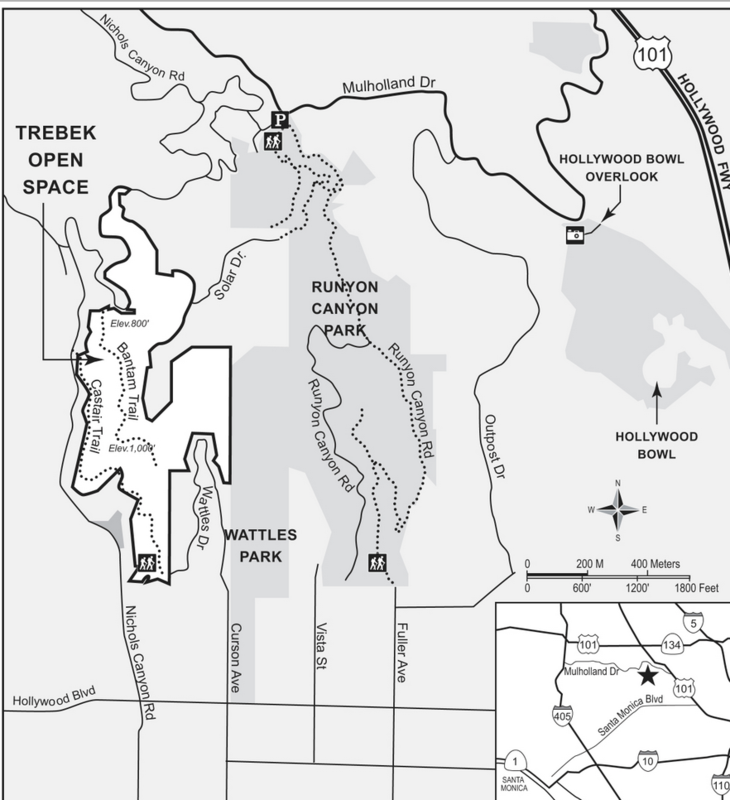 The run I have created here is 2.7 miles following the Runyon Canyon Road route, which is a 678 foot elevation gain. It’s possible to loop back using some of the other trails, or do some running on Mulholland Drive (careful!) and some of the surrounding roads from the northern gate of the park. You can also loop back through the Outpost Estates neighborhood — gorgeous homes, quiet streets, hilly! I love what you fellows are now up to. This type of cool work and exposure! Keep up the fantastic work guys, I’ve incorporated you blogroll. Hiya, I’m really glad I have found this info. Nowadays bloggers publish just about gossips and internet and this is actually frustrating. A good website with exciting content, this is what I need. Thank you for keeping this website, I will be visiting it. Do you do newsletters? Can not find it. I’ll immediately clutch your rss as I can not find your email subscription link or e-newsletter service. Do you’ve any? Please permit me realize in order that I may just subscribe. Thanks. You produced some decent points there. I looked on the internet for the problem and found most individuals will go together with along with your web page. Just wish to say your article is as surprising. The clearness on your post is simply excellent and that i could assume you’re knowledgeable in this subject. Fine with your permission allow me to grasp your RSS feed to stay updated with imminent post. Thanks one million and please keep up the enjoyable work. By having so much written content do you ever have any issues of copyright violation? My blog has a lot of completely unique material I’ve either created myself or outsourced but it appears a lot of it is popping it up all over the web without my authorization. Do you know any ways to help stop content from being ripped off? I’d really appreciate it. We are a bunch of volunteers and opening a new scheme in our community. Your web site offered us with helpful information to paintings on. You’ve performed a formidable process and our entire community will likely be grateful to you. Needed to write you this bit of note in order to say thanks yet again on the fantastic pointers you have contributed in this case. It is simply extremely open-handed of people like you to convey unreservedly all that a number of us might have made available for an ebook to get some bucks for their own end, and in particular given that you might well have done it if you ever decided. These inspiring ideas in addition served to be a easy way to fully grasp other people have a similar zeal the same as my own to see many more with reference to this condition. I’m sure there are numerous more enjoyable times in the future for individuals who looked at your blog post. 2.7 miles with various options. Dirt paths. Fuller Gate, 2 blocks north of Hollywood Blvd.